Dunn Dental approached us looking for a modern and impactful design that would demonstrate their family-oriented nature while simultaneously showcasing their fresh and current involvement with technology. We knew the perfect way to handle that design concern, and the result is this magnificent and accessible website. The overall design opens with a professional and engaging slideshow that walks the line between video and still images to take advantage of the benefits of both. Video images on the home page have been shown to improve engagement with the viewer, but also comes with additional loading times, something that can impact the conversion rate of your site. By using subtly moving images, engagement is improved and loading times kept low. This is one of the many background decisions that were made to perfect this website. The primary color palette for this website is light blue, gold, and white, some excellent choices that were used to their best effect. • Contrast – The unobtrusive and friendly nature of light blues in website design makes their contrast with the more clinical whites and the energizing warmth of gold. Overall creating a beautiful and welcoming website. • Conversion – The clever use of color can play an essential role in driving conversion, that process by which visitors become clients, patients, and customers. In this site, light blue creates a friendly and low-pressure atmosphere while encouraging the visitors to fill out the sites forms as in this contact form. 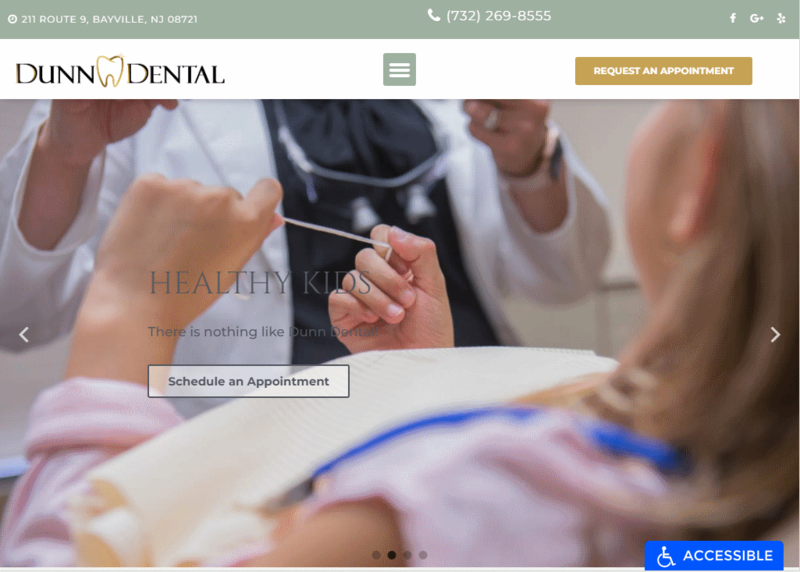 The design elements found in the Dunn Dental Website are striking and serve to maintain the gentle and welcoming atmosphere of the page. Throughout the site, you are greeted with gentle imagery, and friendly faces that make the viewer feel like this new clinic may just be right for them. • Space – Use of space on this website is efficient without being overwhelming, The individual sections of the website contain just enough content to be approachable but without bogging down the user’s experience. • Navigation – Navigation throughout the site is facilitated by the ever-present hamburger menu at the top of the screen that remains as you scroll through the site. Links to various areas of the site are also highlighted throughout the design. • About Us – The selection of About Us pages available through the hamburger menu are robust, but the introduction to the primary dentist can be found on the home page, ensuring that the visitors get a chance to meet their new dentist immediately. Leveraging the marketing angle of your website is one of the trickiest parts of getting a site ‘right’. Dunn Dental demonstrates several conversion techniques, those methods by which a site subtly encourages visitors to become customers, used to great effect. Contact Forms – The contact forms on the site, as seen above, are very lightweight and unobtrusive while still being prominent. With their limited number of entry fields, they’re comfortable for patients to fill out without overthinking it. Testimonials – One of the most underappreciated parts of driving conversion is the testimonial. Word of mouth is still one of the best forms of advertising, even if it’s just through your website. That’s why Dunn Dental includes a ‘Review Us’ form on their home page, to encourage patients to provide feedback even after they’ve left the office. Navigation – Navigation is slick and easy on this site as the hamburger menu sticks with you throughout. Contact Information – Contact information is immediately available in the header as you navigate the site, and there’s even a prominent ‘request an appointment’ button to help streamline the experience. This site represents a friendly and welcoming practice that is looking forward to bringing your family into their practice’s. It respects the patient’s time and intelligence by providing multiple navigation options but putting the most important information up front.